Just as good fences make good neighbors, good trees can make good fences. They are attractive and can provide privacy while block both the wind and noise. Best of all, they will never require painting. 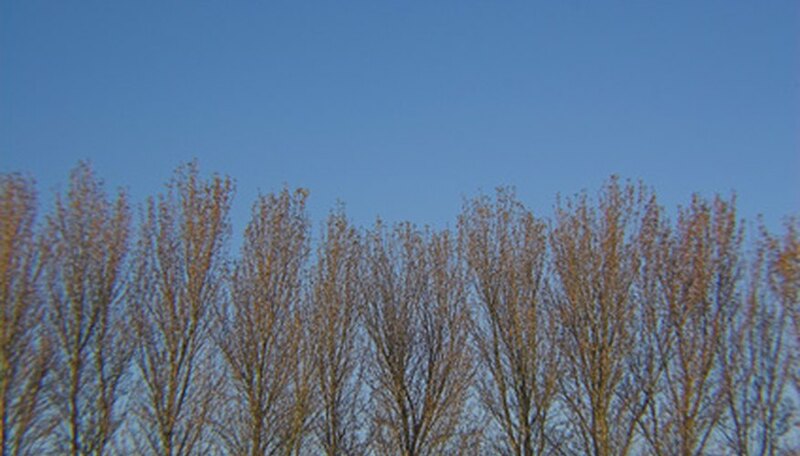 When trying to decide which tree to plant, consider how tall and dense you need them to be. If you need privacy in a hurry, you may want to plant a quick growing variety. You should also consider the location you plant to plant them since some trees take up more space and require specific soil and light conditions to grow. The Arborvitae Green Giant (Thuja plicata "Green Giant") is a dense evergreen commonly used to create privacy screen and windbreaks. Its mature height is between 40- to 50-feet tall when grown alone and about 20-feet tall when planted in a row, but it can be trimmed into a 6-foot hedge. It grows fast, between 3 to 5 feet per year once established. It is resistant to disease, insects and deer; adaptable to wet or dry soils and is drought tolerant. It has a mature spread of about 15 to 18 feet. It is hardy in USDA Hardiness Zones 4 through 8 and can be planted in full or partial sun. The Leyland cypress (Cupressocyparis leylandii) is another fast-growing evergreen. It grows about 3 to 4 feet per year and can reach heights of 50 feet or more with a 15- to 25-foot spread. It should be planted in full sun in a well-draining, fertile soil. It will tolerate acidic and alkaline soils, partial shade and salt spray. Plant them about 5- to 7-feet apart when using the as a privacy fence. It is also drought resistant and requires little maintenance. Leyland cypress are hardy in USDA Hardiness Zones 6 through 10. The Canadian hemlock (Tsuga canadensis), also known as the eastern hemlock and the hemlock spruce, is a fast-growing, long-living evergreen. They will grow about 35- to 70-feet tall with a 25- to 35-foot width. Plant them about 5- to 7-feet apart if using as a fence. It can be planted in any lighting conditions from full sun to full shade. They are adaptable to different moisture conditions but should be planted in a loamy or sandy soil. Canadian hemlocks are hardy in USDA Hardiness Zones 3 through 7. Willow hybrids (Salix spp.) are a very fast-growing deciduous tree. It can grow more than 6 feet each year. When planted in rows, they will reach heights of about 35 to 45 feet with a 5- to 6-foot width. Plant they about 5-feet apart. They will adapt to a variety of soil conditions and can be planted in full or partial sun. They are disease resistant and hardy in USDA Hardiness Zones 4 through 9. Nellie R. Stevens Hollies (Ilex aquifolium x I. cornuta "Nellie R. Stevens") are very fast-growing evergreens—about 3 feet per year. They grow about 15- to 25-feet tall with a 5- to 10-foot width. Plant them about 5- to 6-feet apart if using them as a privacy fence. They can be planted in full or partial sun and adapt to a variety of soil conditions. They are drought tolerant and require very little care. They are hardy in USDA Hardiness Zones 6 through 9. The Eastern red cedar (Juniperus virginiana) is a smaller, dense, aromatic evergreen. It grows about 20- to 40-feet tall with a 10-to 20-foot width. When planting in rows, they should be spaced about 5- to 7-feet apart. This cedar grows rapidly, is drought resistant and heat tolerant. It will adapt to a variety of soils and can be planted in full sun to partial shade. It is hardy in USDA Hardiness Zones 3 through 9. Oregon State University: Want Back Yard Privacy? Plant Columnar Trees, Shrubs.